Baxi has released the first micro-CHP, or Combined Heat and Power, system for the home called the Ecogen. It’s a revolutionary wall-hung combined heat and power appliance that can provide efficient gas central heating and hot water like any other boiler, but also generates electricity for use in your home. That means it’s not only greener than traditional systems, it’s also more cost efficient too. Micro-CHP is the process of generating both heat and electricity from one source. CHP has been used for years on a bigger scale in hospitals, school and office blocks, so it’s a well trialled system. With a micro-CHP system fitted you can provide your home with heating and hot water generated at a low cost as well as two thirds of your home’s electricity requirements according to field trials untaken by Baxi. By using this electricity to power your household appliances it means you can buy less electricity from your energy supplier, potentially sell back any unused electricity, lower your electricity bills and reduce you carbon footprint. How does the Baxi Ecogen work? The Baxi Ecogen looks and works like any conventional boiler. However, the system uses a special Stirling engine that is heated by burning gas. 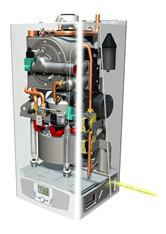 The unit responds to a heat demand of up to 6kW by igniting the engine gas burner. The heat causes helium inside the engine to expand, pushing a piston up and down between a copper coil to generate up to 1kW of electricity – like an alternator in a car. It looks just like a standard boiler, so you can have it in your kitchen, garage or utility as a direct replacement for your old boiler. And it offers its maximum cost efficiency when you use electricity as its being generated by the system, for example doing your washing in the evening when the heating is on. The Ecogen comes with a built-in energy meter so you can see how much electricity is being produced and comes with a range of controls to control room and hot water temperature to further reduce the cost of your bills. Financially you’re looking at paying around £5000 for a unit, about twice the price of a large traditional boiler, depending on the size and type of your property. However, you could save up to a claimed £600 on your annual fuel bills. And any electricity you don’t use can be sold back to your energy supplier for an agreed tax-free, inflation-linked price under the government’s new feed-in tariff called the Clean Energy Cashback Scheme as it’s a renewable energy source. Because the electricity is generated close to its point of use it is more efficient than that provided by power stations, reducing carbon dioxide. Baxi claim an Ecogen will save approximately 0.8 of a tonne of carbon dioxide over an A-rated boiler and 3.3 tonnes over a G-rated boiler. The Clean Energy Cashback scheme is designed as an incentive for energy producers to move away from conventional fossil fuels to renewable energy sources. It is a government legislation that guarantees a fixed, premium rate for renewable electricity fed into the national grid. The power companies are obliged by government legislation to buy the renewable electricity, the additional costs of which are passed on to the customers. Electricity suppliers will pay householders a generation tariff of 10p every kilowatt hour (kWh) of electricity generated and an export tariff of 3p for every kWh of electricity exported back*. 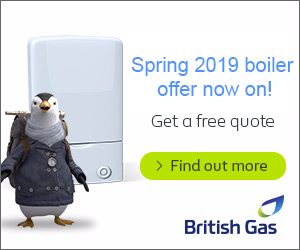 *Based on official PAS67 and APM results April 2010 (compared to a SEDBUK band G boiler reported by Baxi).